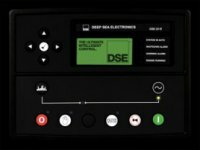 The DSE5510M is an Automatic Engine Control Module, designed to provide advanced load share functionality for diesel and gas generating sets that include non-electronic and electronic engines. The module also provides excellent engine monitoring and protection features. The modules load share functions include, automatic synchronising with built in synchroscope and closing onto dead bus. Direct and flexible outputs from the module are provided to allow connection to the most commonly used speed governors and automatic voltage regulators (AVR’s). The module has been designed to combine a maximum of 16 generators and 16 mains (utility) supplies up to a maximum of 20 in one system, e.g. 16 generators and 4 mains (utility) supplies (DSE5560 required to synchronise with the mains) The module has the ability to monitor under/over generator volts, over current, under/over generator frequency, under speed, over speed, charge fail, emergency stop, low oil pressure, high engine temperature, fail to start, low/high DC battery volts, fail to stop, generator short circuit protection, reverse power, generator phase rotation error, earth fault protection, loss of speed signal, fail to open, fail to close, out of sync and MPU open circuit failure, negative phase sequence and loss of excitation. 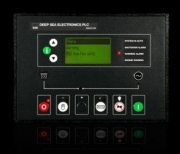 The DSE2510 is remote device designed to work with the DSE7310 Auto Start and control module. Up to three remote devices can be connected to one host control module up to 1km away. The devices offer exactly the same instrumentation, control and monitoring capabilities as the host control module, including starting and stopping of the engine. All three remote devices will display the same information at the same time, while the host controller is able to work independently, showing different sets of information. The modules are simple to operate and feature the same user-friendly menu layout as the host module. All communications and programming are done via the host module only. The remote devices simply mirror the programming of the host module making the system quick and easy to install.